From the I'm so sleepy department... Thanks to musicNmind for another dope show! 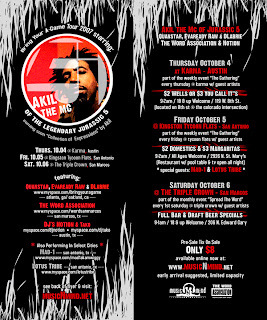 Akil of Jurassic 5 fame will be @ Karma on Oct 4th for another installment of The Gathering. Pre-Sale tix are only $8 here. Halloween's comin' up... anyone got some good costume ideas? I'm thinking about being an iPhone, but I bet there will be several of those. Jurassic 5 was a six- and then later five-piece hip hop group formed in 1994. Rappers Chali 2na, Akil, Zaakir aka Soup, Mark 7even, Benny C, Tommy M and turntable maestros DJ Nu-Mark and DJ Cut Chemist came together from two separate crews, the Rebels of Rhythm and Unity Committee. They currently plan to split up. The group formed at the Los Angeles, California health store The Good Life at open mic sessions. They released their first record, Jurassic 5 EP, in 1997. The record cemented their position in the 1990s alternative hip hop movement, alongside artists such as Company Flow, Black Star and Kool Keith. The EP was later repackaged with additional tracks and released in December 1998 as the band's full-length debut album, entitled Jurassic 5 LP. The tracks harkened back to the old school attitude of New York's Native Tongues Posse, which included De La Soul, the Jungle Brothers and A Tribe Called Quest. This was evident on the song "Concrete Schoolyard" ("Let's take it back to the concrete streets/Original beats from real live MCs"), and the album even provided the troupe with a surprise Top 40 single when it reached number 35 in November 1998. The other stand-out track, "Jayou", was built around a flute loop from Pleasure Web's "Music Man Part 2".